You are currently browsing the tag archive for the ‘santa fe’ tag. I sometimes think that all works of art are born somehow of fire. Words burn in a writer’s brain, unforgiving until they can spill upon page. Motion burns from the core of a dancer’s muscles. Paintings are licks of flame risen from a spirit through a brush to a canvas. Even in photography, there is a burning peaceful need to capture what is seen by one set of eyes into something that can be seen by others, a sharing of the embers of the photographer’s vision. The center of the earth that we walk on each day is made of fire, and it passes through layers of rock and soil and the skin of the soles of our feet to the center of the souls of our being, and must be expressed somehow. In this sculpture studio, we found the purest expression of the creative fire, molten iron casually poured by men protected from its destructive power, men looking like creatures from the center of the earth themselves, men who controlled the flow of creativity, channeling it into molds and frames, containing it, shaping it, melding with it, as it fashioned itself through the sculptors hands into art, cold to the touch but still retaining that fire within. As we all do. It reminded me that art can be dirty and primal and beautiful, full of heat and passion and practicality all at the same time, blending hotly and gently to create an artist’s ever-imperfect vision, for imperfection is the nature of art as viewed by the artist, and what makes them strive to improve always, trying to touch that fiery core with their bare hands, capture it, rejoice in it, and share it. Shidoni, Santa Fe, New Mexico. Sometimes, it’s hard to tell, especially when depression shadows you, constantly grabbing for your hand to hold you back. Even when I know the things I need to do to come out from a bout, I sabotage myself by not doing them. Sigh. It’s a Big Jesus Sale! I don’t know if this means it’s a sale on Big Jesuses or if it’s a big sale that encompasses all Jesuses, but either way the sign struck my fancy. I mean, you can’t buy Jesus. He’s way too ethical for that. I don’t actually recall even seeing any Jesuses at this interesting and chock-full shop that popped up on the other edge of Cerrillos Road from Jackalope, which it is trying to resemble. It was worth a stop on the way out of town. The rooftop bar at La Fonda Hotel is scorching in the summer at cocktail time, so they have been most considerate in putting up canopies that shield the sun while unveiling the sky. We have had enough hot in our western world in the month of July, and while I would never expect to hear myself say it, I am looking forward to cooler weather. If I must be hot, then let me be by a beach. Soon. My fascination with doorways, about which, I’ve written before, continues. I am not the only photographer was a passion for windows and doors, though my passion extends to porches as well. Perhaps it’s the secrets that lie behind those doors, all the life that exists back there, but to which I am simply blind. I do love it when old lace currents hide interior secrets. That’s how I want my home to be. I have always wanted lace curtains, providing only mysterious and tempting flashes of my inner world. And a romantic touch of balcony merely adds to the dream. Much like we seem to be going through on an individual and global soul level this year, there is a door at the end of a shadowed tunnel, and that door is bathed in light. This is a more pleasant tunnel than I think many of us have wandered down of late, but perhaps you’ll appreciate the concept. The Stairs or the Door? Even though the door is turquoise, my favorite color, the stairs look as if the light of heaven is leading one to the surface…our lives are all about choices, aren’t they? Since last week’s rant on the Republican National Convention, I’ve been quiet and contemplative, with dreams of having pleasant discussions with Donald Trump as we walked along a lovely beach, which made me feel like I was drinking the Kool-aid. If you’re not of a certain age, you might need to Google that term to understand its sad reference. I’m looking forward to feeling the antithesis of what I felt last week, as I watch the Democratic National Convention. The last few days did not disappoint. It’s been tolerably temperate here in Colorado as Christmas preparations proceed everywhere but my house. I have high hopes, though, of getting my tree this week, and putting out what decorations I have. Maybe I’ll share those with you as a Christmas countdown. As you might expect, they’re all a little odd, and mostly animal-related. Kelsea comes home on Saturday. Saturday is also the ninth anniversary of my Mother’s death, which makes this week very hard for me on a level deeper than I care to admit. The pain and depression of losing her still lies very close to the surface, and causes me to lose my temper at little things, which is not how I behave anymore. So I re-cracked my healing broken toe kicking the closet door this morning (frightening Mr. Man – I’m sorry, Mr. Man), and cried over my computer password not working. I know I will be better when this week has passed. MKL and I have a performance of Amal and the Night Visitors (a forgotten childhood favorite) to look forward to on Friday, and a night at the Stanley Hotel to look forward to on Sunday, so pictures will follow. I do hope your holiday preparations are moving right along, and that the spirit of the season eases your burdens and cares, instead of intensifying them. That’s what Christmas is all about, after all. 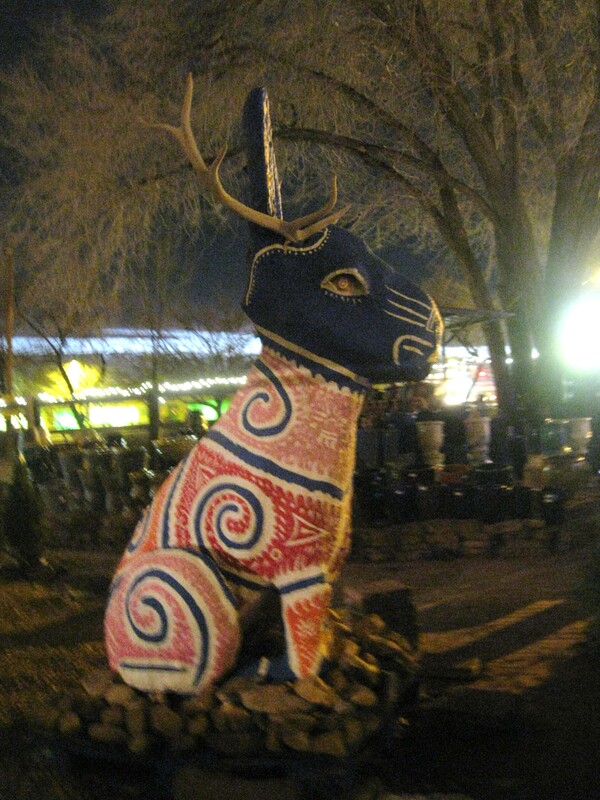 It’s so nice to have a Jackalope for the holidays!